The Tavern is a natural gathering place. The wood burning fire place, boutique bar, soft sofa and café table creates an inviting space. Guests can frequently be heard sharing their travel adventures. 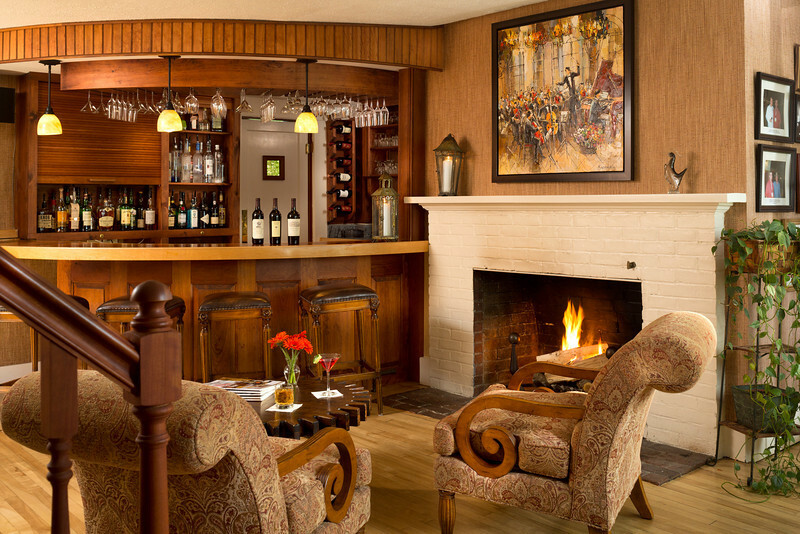 Views of Cannon Mountain and Mount Lafayette can be enjoyed from the large windows. Every day at 4:00 pm it’s time for small bites, a surprise from our chef. It can be anything from local cheeses to crab cakes or a dessert sample. While the official opening time for the bar may vary with the seasons, feel free any time to ask us to pour a glass of wine or beer. We stock most premium liquors and have a cocktail list for your enjoyment. In the warmer months we will gladly deliver your drinks to the front porch or pool. Our wine list has earned the Wine Spectator Award of Excellence. Many guests enjoy arriving early for dinner so that they may enjoy a pre-dinner drink.